Report of a crash with a vehicle fire. Crew on arrival reports a fully-involved pickup truck fire. The pickup truck fire possibly involves diesel fuel and magnesium (wheel well?). Traffic backed up past the I-355, I290 Split. Extrication crash with a rollover tanker truck,at least one other truck and a minivan. The tanker is reported to be empty. Crew on arrival reports two or three trucks and a minivan involved in a crash. Victim extricated from the tractor by 8:43 p.m. Possibly a second crash or a vehicle fire southbound I-294 south of Irving Park Road. At least two patients transported to Advocate Lutheran General Hospital. A168 transported one patient to Level I Trauma Center Advocate Lutheran General Hospital. A169 transported one patient to Level I Trauma Center Advocate Lutheran General Hospital. Schiller Park ambulance transport unknown. EMS: A169 A168 Schiller Park A5? Clear to move up by 9:43 p.m.
BC12 requests two additional ambulances to the scene by 8:29 p.m.
General Alarm requested by 8:29 p.m.
Report of a fire in a high-rise building; fire contained to the penthouse and venting out from the penthouse -- not into the building. E55 leading out by 8:57 a.m. The fire declared out by 9:02 a.m.
Report of a bulldozer crash with injuries. Report of an employee that was run over by a bulldozer. E2 requested for additional manpower at 6:22 AM. Newport Heavy Rescue Squad requested at 6:24 AM -- needed to stabilize an unstable crashed bulldozer. EMS: R ?? A ?? E43 crew on arrival reports a 1 1/2-story construction with a fire. Primary search on the first floor complete and negative by 7:53 p.m.
BC17 reports fire is out by 8:01 p.m.
MABAS Division 20 Box Alarm on Box #199 to the Plan 1 level for an accident with multiple injuries. Transports to Elmhurst Hospital. At least one Advanced Life Support patient transported to Loyola. EMS Box struck out at 6:22 p.m.
Report of a snowmobile crash with fire. BC6 on arrival reports two snowmobiles collided and one of the snowmobiles is on fire. Checking for injuries. Fire extinguished by 9:34 p.m. Possibly one transport, then two additional ambulances were requested at or near this scene. At least one person was injured from a fall on the ice. Report of a man person seriously injured in a fall down a flight of stairs at a house on Grace Lane. Flight for Life called but diverted to Good Shepherd Hospital to meet ambulance at Good Shepherd. BC8 reports a 1-1/2-story ordinary, 25x60, with E125 leading out, T53 main to the roof, companies are working by 12:26 am. Human Services needed and fire under control by 12:36 a.m.
Holding up the working fire response, except the RIT ambulance by 12:38 a.m.
Report of smoke in a house. Police on arrival report the fire is in the basement. BC22 on arrival reports light smoke showing. MABAS Division 4 Box Alarm on Box #22-2R for a structure fire at 3:02 a.m.
Police report a car crash in a retention pond with a person that doesn't want to get out of the vehicle that is in the water. Person got out of the vehicle as firefighters arrived. Initially, no injuries reported. Police activity and firefighter/paramedics on scene searching the Streamwood Behavioral Health Center building after a report of a man threatening suicide by hanging at the building. Location of male, age 28, initially unknown. The missing suicidal person is not believed to be a patient. Report of some type of explosion that blew out the basement windows. Possibly an overheated furnace. Red Cross and warming buses requested for residences. OFI and Building Department requested. Report of a house fire with flames showing from the neighbor's house, and with two people possibly still in the house. E244 crew on arrival reports a fully-involved house fire by 1:37 am. Two patients met by A 243 paramedics for assessment by 1:43 a.m.
Second ambulance requested by 1:50 a.m. WORKING FIRE by 1:45 AM? Report of two people shot at a house on Home Ave near Lakewood Ave.
A1255's crew treating one critically injured male patient. One patient walking with a graze wound. MABAS Division 24 Box Alarm on Box #11-2 for a commercial building fire at "Your Town Cleaners." Second ambulance requested by 12:38 p.m. Crew on arrival reports everybody is out of the car. One transport; four medical refusals. Four people in the rollover vehicle; one driver in the other vehicle. Police on the scene request a rescue extrication of a horse from a horse trailer parked at Full Moon Family Restaurant -- a 24-hour restaurant near Lake Bluff and North Chicago. A horse was caught after it tried to jump out of a horse trailer. Firefighters improvised to support the suspended horse with a three-inch blitz line hose used as a girth harness, which was linked to the bottom of the Tower Ladder truck basket with rescue rope and carabiners. Citizens, including the horse's owner used the bed of a pickup truck and a bobcat tractor to support the horse before firefighters arrived and improvised with their rigging. The horse was safely rescued with only minor cuts. North Chicago Fire Chief Dell Urban credited Lt. James Axtt in command of the call and rigging, and Battalion Chief Josh Rickabaugh and firefighters Marc Harman, Brian Henderson, Carlos Perez and Leonard Cooksey as successful crew members on the call..
MABAS Division 5 Box Alarm on Box #5-52 for a crash with multiple injuries. Report of a senior care bus vs SUV. Canceling Harvard Squad by 8:43 am. Box Struck out by 8:55 a.m.
Report of one or two people beaten in the head with a baseball bat. Police on arrival report at about 8:58 p.m. three patients on the scene. Report of something on fire in the attic at a house at Normandy Place at Saint Tropez. Crew on arrival reports a little bit of light smoke showing from Division B.
Attic fan on fire with smoke on the second floor. Checking the attic; dry line in the front door by 9:30 a.m.
E113 crew on arrival reports smoke showing at 11:43 a.m.
Ambulance assigned to Side A by 11:48 a.m. updated to Side C in the alley by 11:49 a.m.
BC18 reports rescue of one individual, one line on the fire, ground ladder on Side A by 11:49 a.m. Still and Box requested at 11:54 a.m.
2-1-24 reports four lines on the fire with a large amount of fire knocked down and all companies working at 12:04 p.m.
CV271 on scene at Van Buren and Cicero ... CFD Main says he didn't tell him his location when 224 asked. 2-11 ALARM AT 12:11 PM on orders of BC18 then 2-11, MAYDAY, and EMS Plan 1 for a missing firefighter. MABAS Division 5 Box Alarm on Box #5-1440 for a garage fire next to Ehorn -Adams Funeral Home. Police called in heavy smoke coming from a garage at 9:00 AM. Report of "heavy smoke" and 1401 reports a header by 9:01 am. Fully engulfed garage fire at the house next to Ehorn-Adams Funeral Home. Report of a domestic stabbing at a home on McGovern St near Deerfield Road. A female patient was transported to Highland Park Hospital by A32's crew. Highland Park police and area police are searching the area of McGovern Street and Laurel Avenue, where a male suspect was last seen. Police are investigating a report that a man stabbed his wife in the chest. The suspect is described as a male/Hispanic with a mustache, wearing a black shirt. Report of a gas leak with an inside odor and hissing noise. BC3 on arrival requests police to move back away from the gas leak about 100 feet. BC3 reports a high volume line blowing gas freely at the scene by 9:45 p.m. Crash with ejection injuries resulting in a fatality. Lake County Sheriff reporting one dead at the scene by 11:23 p.m.
BC55 on arrival reports two vehicles involved in a crash -- out investigating by 11:23 PM. One patient outside the vehicle on the ground, and one patient being assessed by paramedics. One patient transported one patient to Advocate Good Shepherd Hospital -- leaving scene about 11:57 PM. SQD26 dispatched for a light tower for a fatal crash investigation at 1:13 AM. Northbound and southbound Route 83 blocked near crash scene. Northbound blocked at Route 22; southbound blocked at Royal Melbourne Drive. The crash appears to be located near the southbound shoulder near a utility pole about 290 feet north of Route 22. There appears to be fresh tire tracks in the snow on the northbound shoulder, south of the crash scene that appear to veer toward the crash scene. There is no confirmation whether these tracks are connected to the crash. MABAS Division 4 Box Alarm on Box #16-60 for a house fire with extra alarm for Tenders. MABAS Division 3 Box Alarm on Box #21F-685 for a house fire response that was elevated to a 2nd and 3rd Alarm. Report of a house fire with a Still and Box Alarm. E94 on arrival reports they have a garage fire by 9:16 p.m.
E119 assigned to feed E94. Returning extra companies by 9:33 p.m.
Report of a crash with injuries with vehicles in lane 2 and 3. A54 crew on arrival reports 3 cars with moderate damage by 3:10 p.m.
Second ambulance requested by 3:13 p.m. -- A53 assigned. Report of a car hit the left shoulder and went across the highway and was hit. The crash involves four or five cars on northbound Tri-State just north of Deerfield Rd. A20 crew on arrival reports 5 vehicles involved in a crash with major damage on one vehicle by 2:50 p.m.
Third and fourth ambulances requested by 2:52 p.m.
Extrication complete by 2:59 PM. Report of a apartment flat with a fire on the second floor. Crew on arrival reports reports a 2-story ordinary with heavy fire on the second floor by 3:19 p.m..
Water problems reported by BC19 -- third and fourth engines assigned to look for good hydrants. E121 and E122 assigned. fire on the second floor, companies in the process of deck gunning it and leading out by 3:20 p.m.
CV275 reports the main body of fire appears to be out by 3:33 p.m.
Searches in the basement and first floor negative by 3:33 p.m.
MABAS Division 19 Box Alarm on Box #769 for a person through the ice. Frankfort immediately canceled the dive response after the victim was recovered. Report of an alley garage on fire. E65 crew reports their southbound with an alley garage fire by 1:25 a.m.
BC15 reports E65 crew has a line led out on a 20x20 frame garage -- fully involved; and E34 leading out with a second line from the alley by 1:30 a.m.
Power lines down; ComEd requested. Fire under control by 1:36 AM involving two alley garages, 20x20. Original fire garage is 4444 S Troy; 4448 Troy has minor exposure. Report of shots fired, then a person shot in the alley behind the Dunkin's Donuts. Domestic Dispute: Advanced Life Support for woman with three GSW. Man dead at scene. Police on the scene report a female with three gunshot wounds by 6:24 a.m. and that the scene was secure by 6:25 a.m.
CPR was in progress by 6:27 a.m.
A421 left for Lake Forest Hospital by 6:31 a.m. with a female patient with extra paramedics on board. The woman was pronounced dead at the Northwestern Medicine Lake Forest Hospital. One male was dead at the scene, in what police described as a domestic incident. Report of a fire on the exterior of the building at Algonquin Sub Shop. Siding caught fire on the C/D corner when owner tried to thaw frozen pipes with a propane-powered heating source. The fire was quickly extinguished, and the fire was declared out by 12:27 p.m. Firefighters removing siding to check for extension of the fire. As is routine in fires at restaurants, the Health Department and Building Department were called to the scene. The restaurant was closed for repairs of smoke damage that extended to the interior. Several fires in Chicagoland, including one in Aurora and one in Huntley in the last few days, have have been caused by attempts to thaw frozen pipes. 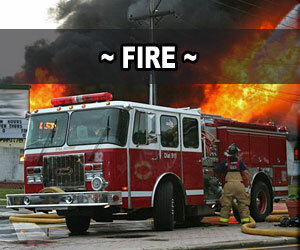 ENGINE(S): E143 E142 Carpentersville Engine, Huntley Engine 944 Fox River Grove Engine? MABAS Division 6 Box Alarm on Box #6-65 for a structure fire (house fire) on a rural farm property. Initially reported as smoke coming from a closet. Report of a house fire with fire out and no extension by 8:53 a.m.
BC18 reports fire is out by 8:53 AM -- no extension, and holding the working fire response. BC18 reports final search complete and negative by 8:57 AM. MABAS Division 25 Box Alarm (3rd Level) on Box #102 and #602 for a structure fire at "Grand Bear Lodge." The fire is reported to be in the Water Park area. The initial fire call was about 5:30 a.m.
Report of a chimney fire at a house. BC34 on arrival reports nothing showing from the outside by 5:36 p.m.
BC34 requests a structure fire response at 5:39 p.m. for a fire in the attic. Extra companies returned by 5:53 p.m. -- first due companies can handle. Frozen hydrant at the location. SQUAD(S): SQD341 TENDER(S): TANKER ?? E116 crew on arrival reports a 2-story frame with a fire. BC19 reports a 2-1/2-story frame, 25x75, fire on the first floor, one line led out, aerial to the roof, primary search underway by 6:45 AM. BC19 reports two lines led out (one on the first floor and one on the second floor), positive source of water, ground ladders raised, making progress. Two lines on the fire, fire communicated to a second floor apartment, search is negative, secondary search underway, chasing hotspots by 7:02 a.m.
CV274 reports secondary search complete and negative, chasing hot spots and requesting OFI by 7:13 a.m.
CV274 reports they're chasing hots spots and starting overhaul by 7:28 a.m.
Report of smoke and flames from the garage. Crew on arrival reports a 2-story with heavy smoke showing from the garage by 2:18 a.m..
MABAS Division 4 Box Alarm on Box #22-13R for a house fire 4:37 a.m.
MABAS Division 4 Box Alarm 2nd Level on Box #22-13R for a house fire 4:46 a.m.
TENDER(S): Lake Zurich Tender? 341 Wauconda Tender? TENDER(S): Lake Villa, Lake Zurich Tender? 341 Wauconda Tender? Report of an alley garage fire initially reported on Dobson Ave.
BC23 reports outside garbage caught the garage on fire a little bit; off with a line. BC23 reporting trouble with a crowd in the alley about 12:42 a.m.